A Minnesota family stuck in Central America is trying to find a way home. Not purchasing separate travel insurance, which could have covered medical expenses and evacuation, has the Lopez family staying with friends in Costa Rica Emmee Lopez met 10 years ago while studying abroad and turning to friends, family and strangers, little by little, working to get her family home. Three-year-old Axel Lopez broke his leg last week and needed emergency surgery. His cast prevents him from taking a commercial flight back to Minnesota from Costa Rica. Now, his family is reaching out for help. 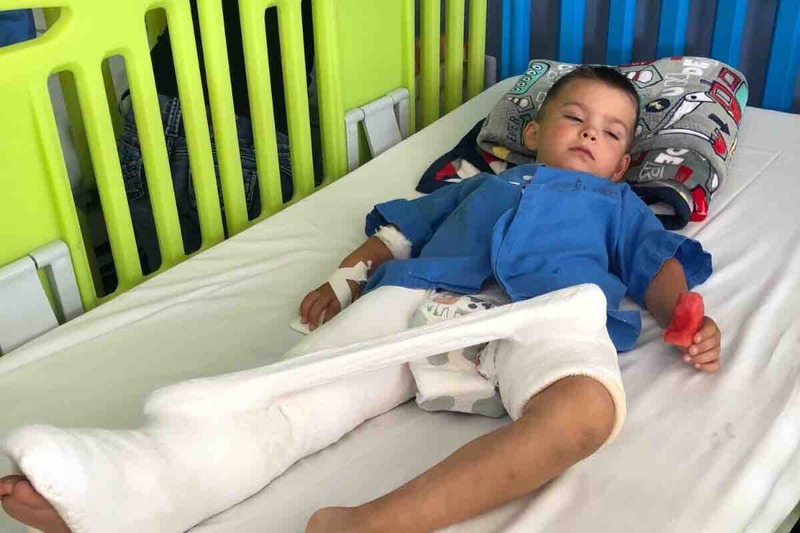 While vacationing in Costa Rica, on their second day, three-year-old Axel Lopez broke his leg and needed emergency surgery. His cast prevents him from taking a commercial flight back to Minnesota from Costa Rica. Now, his family is reaching out for help. Visit the GoFundMe page if you want to help the Lopez family get back home. Axel spends all of his time laying down. His mom Emmee said Axel fell down and broke his femur. “He was holding his leg and he just said ‘mommy, mommy, mommy.’ He was screaming in pain,” Emmee Lopez said. They rushed him to National Children’s Hospital (Hospital Nacional de Niños in San Jose), where hours later he had surgery. Axel’s cast goes from his waist down his right leg, and covers part of the left. “As a mother that’s the most heartbreaking thing to see your child in pain,” Lopez said. She thought they’d be able to travel home but instead learned he can’t take a commercial flight because he can’t sit up. “’I just want to go home,’ and he says that constantly, ‘I just want to get my cast off. I just want to be in my own bed,’” Lopez said. Lopez said the U.S. Embassy recommended booking an air ambulance. With that came another shock, a flight with a $42,000 price tag. “Our insurance denied us because we’re out of the country. Unfortunately, because we were led to believe our insurance would cover it,” Lopez said. She’s turned to friends, family and strangers. A team, little by little, working to get her family home. “I am so grateful for everyone,” Lopez said. Doctors said the cast may come off in mid-August, but the family hopes they can come up with enough money to fly home sooner. Emmee Lopez started a GoFundMe campaign to raise the US$42,000 for the air ambulance. In two days, $24,635 of $42,000 goal raised by 426 people. Visit the GoFundMe page if you want to help the Lopez family get back home.